It’s one of those magical, misty mornings here in the south of England. A light fog gently dips over the trees and you really can’t see the sky for clouds. There’s a damp chill in the air and I find myself craving multiple cups of steaming hot tea. I know that my family will be looking forward to comfort food for dinner. And when it comes to comfort food, Beef and Ale Stew is a family favourite. Beef and Ale Stew is a traditional British dish the whole family will love. 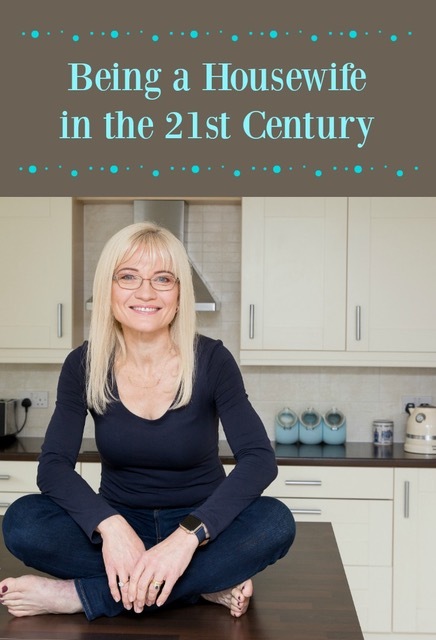 Here in the UK, it’s one of those dishes that nearly everyone has a recipe for – often one that has been handed down from generation to generation. Why Beef and Ale Stew? One of the reasons Beef and Ale Stew is so popular – aside from the fact it tastes so good – is that the recipe calls for cheaper cuts of beef – chuck, braising or stewing steak. They become mouth-wateringly tender with long, slow cooking. You just can’t beat that frugal and delicious combination! British ales are very different to the lager beers often enjoyed in North America. They are usually lower in alcohol but generally the flavour is stronger. Generally served cool, but not cold, ales are an acquired taste – but once you get used to them, they are absolutely lovely. You can buy imported British ales in North America but there are also some absolutely delicious local artisanal ales made in many places in the world now. Of course, you need to bear in mind that the flavour of the stew varies depending on the ale you choose. You can also use Stout, another strong, dark type of beer for this recipe. Long, slow cooking mellows ale’s deeper flavours and makes Beef and Ale Stew a recipe the whole family will enjoy. If you are worried that these deeper flavours might not be to your taste, try my Beef and Beer Stew first. It’s a lighter, but still authentic, version of this yummy recipe that uses lager beers like Coors Light, Budweiser or Labbatt’s Blue. A great make ahead meal, Beef and Ale Stew tastes even better re-heated. Cool quickly, keep in the fridge for 24 to 48 hours and the flavours will develop beautifully. Reheat the stew slowly over low heat, stirring occasionally. Add a little bit of hot water or beef stock to the stew to loosen the sauce a bit if necessary. Having said that, my Beef and Ale Stew smells so good when it’s cooking, I rarely get away with being able to cook this dish without letting people actually eat it. In fact, I often make a double batch so we can have some the first night and more a day or two later. I refer to this dish as family friendly knowing it contains alcohol. While it is no longer believed that alcohol completely burns off during cooking, this dish is cooked for so long it is likely that most of it disappears. Beef and Ale Stew is widely served to children here in the UK – indeed my son ate puréed Beef and Ale Stew as a baby. I realise this may be controversial depending on where you live, so if the alcohol content of the dish concerns you, do keep it for adults only. Beef and Ale Stew is great for casual weekend entertaining as you can make it Friday afternoon, cool, cover and store in the fridge. Then simply reheat it thoroughly to serve for Saturday supper or Sunday dinner. Beef and Ale Stew definitely qualifies as bowl food – the kind you eat with a spoon, sitting on the sofa on a cold evening. For a heartier meal you can share at the table, serve it with crusty bread on the side or with couscous, rice or mashed potatoes and a green vegetable. However you serve it, I’m sure you will find this little taste of British tradition is a real treat! Preheat the oven to 325°F (160°C or 150°C for fan ovens). Heat 1 tablespoon of the oil or butter over medium heat in a large lidded casserole that will go from the stove to the oven (or use a large frying pan for the stove top part and then transfer the mixture to a casserole before putting it in the oven). Gently fry the onion in the oil or melted butter, stirring often. Sprinkle with a bit of salt to prevent it browning to quickly. You just want the onion to soften. Add the remaining oil or butter to the pan and when it has melted in, add the cubed pieces of meat. Brown the meat gently, turning it so that the red colour disappears on all sides. Lower the heat and sprinkle the meat and onions with the flour. Stir in the flour and cook for a moment or two. Stir in the ale, followed by ¾ cup of the beef stock. Reserve the remaining ¼ cup of beef stock. Cook for a moment or two. If you are using a frying pan transfer the mixture very carefully to an oven safe casserole now. Be careful not to burn yourself. Stir in the carrots, along with a good grinding of pepper. Tuck the bay leaf in under the liquid, cover the casserole and put it in the oven. Set the timer for half an hour. When the timer goes off, carefully remove the casserole from the oven. Remove the lid and stir. There should be a good amount of liquid in the pan at this point. If not, add some of the remaining stock. Cover the casserole and return it to the oven for an hour. Remove the casserole from the oven once again. Remove the bay leaf, being careful not to burn yourself. Take a spoonful of the gravy and place it in a little bowl to cool. Meanwhile, check the thickness of the gravy. If it has not thickened up, mix a tablespoon of cornflour (corn starch) with 1 tablespoon of water and then stir it into the casserole. If it is too thick (this is unlikely but it does happen sometimes), add the remaining stock. Taste the spoonful of gravy you set aside earlier, being careful as it still may be hot. Add salt and pepper to the casserole to taste. Cover the casserole and return it to the oven for about fifteen minutes or up to half an hour. Remove the casserole from the oven and allow it to rest with the lid on for 15 to 20 minutes. Serve the Beef and Ale Stew garnished with the parley. Thanks for sharing this! I am going to make it for my grandma who grew up in England! Pinned! Found you on Full Plate Thursdays! Good Evening April, We have been experiencing misty mornings here in Newcastle as well…. and like you I like nothing better than slowly cooked stews during winter time. I look forward to trying your recipe. I love that you served it with couscous rather than mash potato…. although I do love mash potato, its nice to ring the changes. I cooked this and the beef turned out so soft and mellow, it didn’t last long enough! Thanks for the truly wonderful recipe, April! I’m so glad you enjoyed it, Amber! Thank you so much for letting me know 🙂 It really is a family favourite at our house. Looks so comforting! I bet this will surely impress a bunch of guests! Nothing beats the flavor of slow cooking stews! The Beef and Ale Stew sounds really so good. 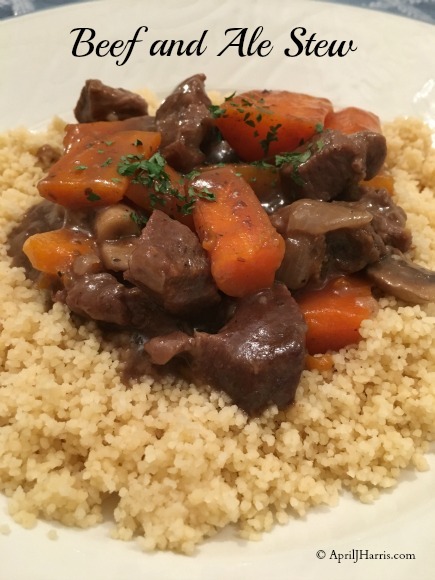 Couscous is one of my favorite grains and here is a new tasty stew to serve with it. Thank you for sharing. 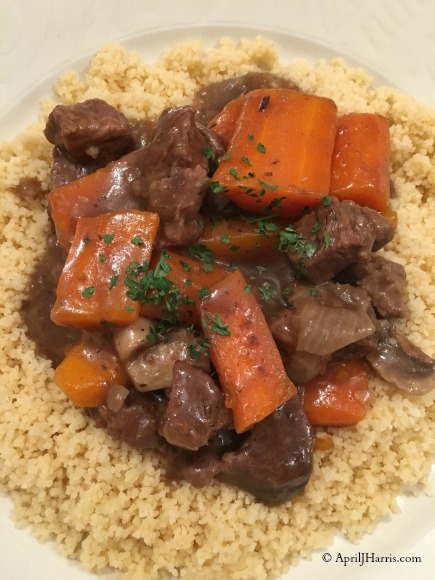 We will just love the flavor of your Beef and Ale Stew, it looks amazing! Thanks so much for sharing with Full Plate Thursday and have a great day. Thank you so much, Miz Helen! I’m so glad you like it. Wishing you a wonderful week! This beef stew looks so delicious. I never made this before and reminds me of my moms recipe. Thanks for sharing the recipe to make this at Cooking and Crafting with J & J.
I’m so glad you like it, Julie! Thank you 🙂 I hope you have a lovely rest of the week too! April, your beef stew looks so hearty and comforting! I would love to try your recipe soon…hoping our high temperatures break here in Florida so we can enjoy it! April, what a warm and comforting meal. I love stews and this one sounds just perfect! I hope you and yours enjoy it as much as we do, Christine 🙂 Let me know what you think! Looks so hearty delicious, April! Subscribed to your newsletter. And I totally agree, stews are better the following day. All the flavors have a chance to meld. Your stew looks scrumptious. Thank you so much for subscribing, Patty! The first issue of the ‘new and improved’ newsletter should be coming out this week 🙂 And thank you for the compliment about the stew too! Absolutely perfect winter comforter, I love beef and ale stew! And Pete ginds it a great excuse to get in even more beer! I’m so glad you like it, Kavey! I’m not an ale drinker, so ale in stew took me a little while to get used to, but now it’s definitely one of my favorites! Your version sounds lovely and looks delish! I am not a beef eater but adding lamb in this perfect. A great dish for colder days! Thank you, Amanda 🙂 This is definitely a perfect fireside meal! That’s a perfect dinner. Britons know how to make a good stew, that’s for sure! Wow great recipe! My mouth is watering. I also want to thanks you for a great party last time I went. I have has stew on my shopping list for two weeks. It keeps getting too warm but I think the crock pot is coming out this weekend. Thanks for sharing at #OverTheMoon! Congratulations! Your post was my feature pick at #WonderfulWednesday this week. Visit me at https://www.marilynstreats.com on Wednesday evening and to see your feature and grab your badge! All hosts choose their own features from the comments left on their blog so be sure to return to my blog for your badge. I invite you to leave more links to be shared and commented upon. Thank you so much, Marilyn! Look forward to ‘seeing’ you at WonderfulWednesday! Lovely comfort food dish for chilly autumn nights…sharing! Thank you so much, Linda, and thank you for sharing too! Thank you so much, Helen, and thank you for the invitation. I will pop by later today!